We go another 10 inches of snow dumped on us last weekend, but that doesn't mean I'm giving up on my garden dreams and plans! Mother nature can't stop me....well technically she can, since I haven't been able to get a single thing done outside yet, but she can't stop me from dreaming! I've been browsing around online for inspirational garden photos, and there are so many wonderful gardens out there that completely put my little country garden to shame! They give me the motivation to get out as soon as Mother Nature lets me and get started on all the spring cleanup that awaits me. 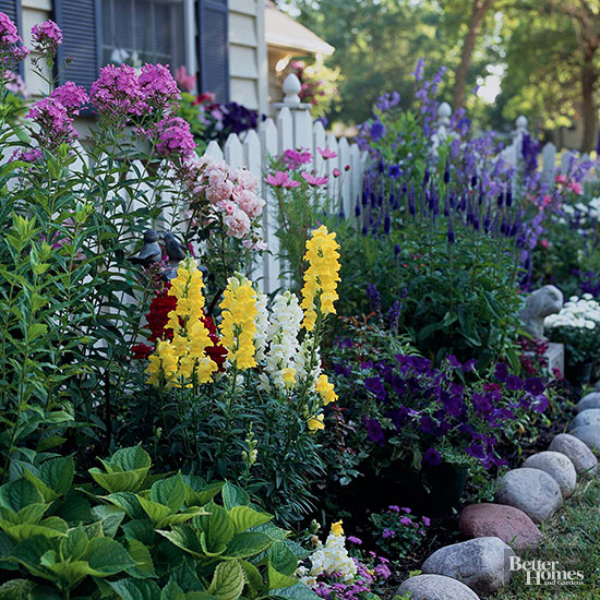 This is the ultimate cottage garden, with plants spilling into one another in a riot of color. The bright colors are perfect against the white backdrop of the house and fence. 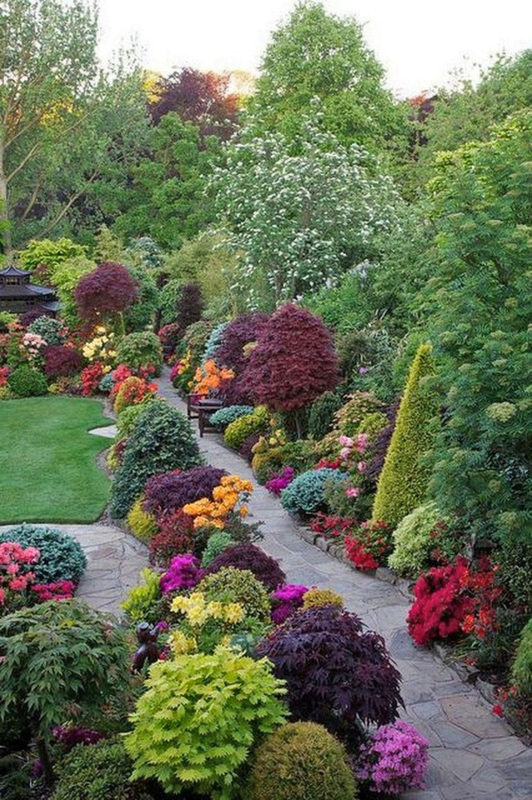 They repeated colors and plants throughout the garden to keep the look uniform, despite the casual plantings. Love, love, love! I love Impatiens - they are soooo easy to grow and fill in so wonderfully! 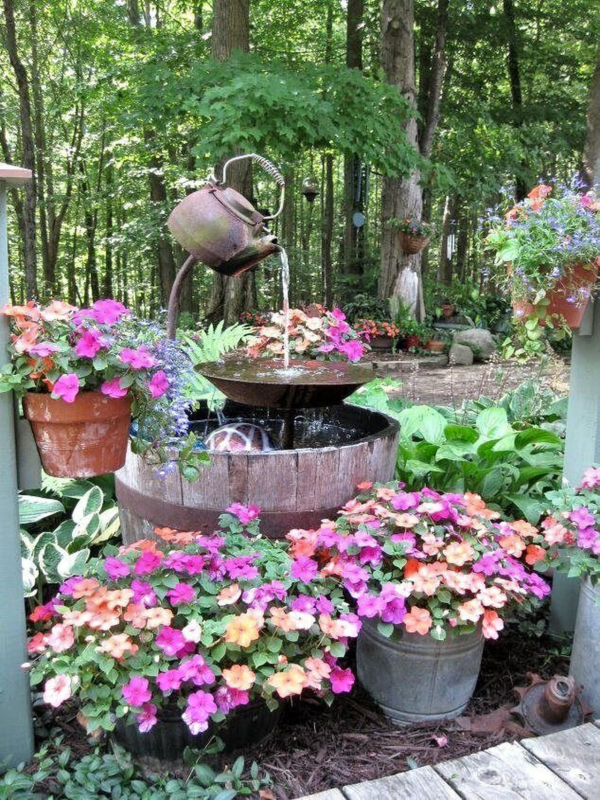 Paired with Hostas and that sweet fountain - what a soothing spot this must be. Impatiens are perfect for a shady location, but they also make Sunpatiens now that can take the heat of the sun. Lowe's carries them, as I'm sure some other big box stores and many garden centers would. There's a completely different look and feel in this garden, but I adore it. I have always wanted to incorporate a Japanese garden into my landscape, a quiet peaceful corner for reflection. This one is perfect - what a haven! I love the limited use of colors in this garden - green, purple, and white - and how it's continued throughout. I'm definitely not that restrained, although in certain areas of my garden I do tend to stick with a color scheme....like at Papa's garden, where I use a lot of pink and white. One of the things I love about this garden is the fact that much of the color comes from foliage, not flowers. The various shades of greens, blues, chartreuse, magenta, and purples - absolutely stunning the way they play off one another. Using contrasting foliage in your landscape is imperative for long season color. 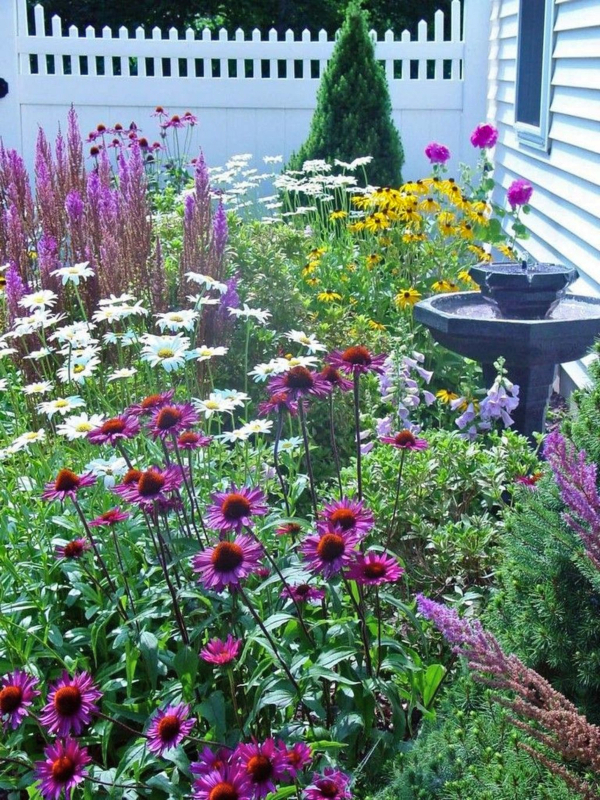 Flowers fade, perennials bloom for only a short while, but foliage lasts all season. This is a stunning example, wow, just wow!! 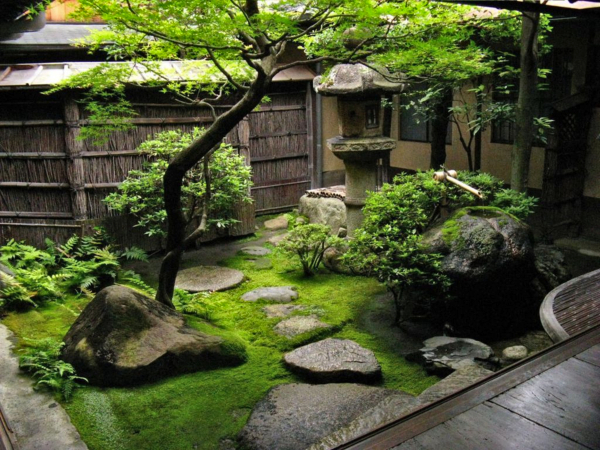 Here's another example of a monochromatic garden with Japanese elements. It's stunning in its simplicity, with the interest coming from the play on textures and foliage, not flowers. Very serene, I'd love strolling down that path with my morning coffee. Here's another great garden, definitely more of a cottage style - I love the bright colors with the white picket fence as the backdrop, and that stone border is charming. Those colorful Snapdragons make me glad I started Snapdragon seeds this year! They are doing well and when our weather warms I'll be bringing them outside to harden off - I see flowers in my future instead of snow, yippee!! What's happening in your garden these days? Has Spring sprung in your neck of the woods? All of these are so pretty. 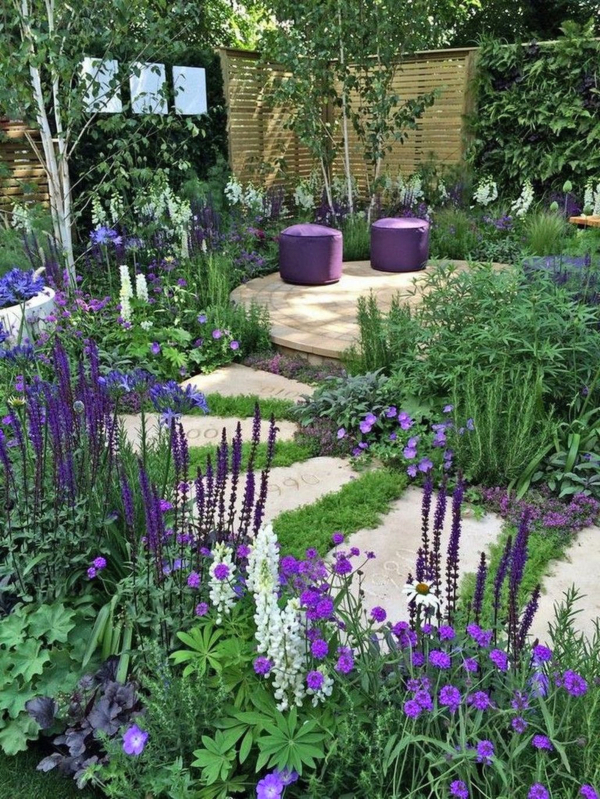 MY favorite is the simple "Purple" garden. I love how they paired the purple puff stools with the scene. I liked that too, Lisa, and they even brought the white to the background with those three white squares. WOW. I love all those gardens. I am not doing to much to our yard anymore since we will be selling in a couple of years. I am taking notes for what I want at the next house though. I love flowers and bushes. Would love to have a willow tree. I love willow trees also, Betty, and my mom has some gorgeous ones on her property. I believe they do best in a wet spot, and their roots can be damaging, however. Love the inspiration! I am hoping to get outside in a few more weeks and get some planting done. I'm hoping to get out soon and at least get some cleanup done, Penny! Oh, sorry you got all that snow last week! We ended up only getting an inch or so and were so lucky! Still waiting for more snow and ice to melt though, but it looks like it will be a lot warmer at the end of the week. I hope you're going to get those warmer temperatures too. Beautiful garden photos. I love the cottage garden style. It looks like Saturday will be a decent day, Sue, but rainy....I'll still try to dodge the raindrops if I can to get a start on outdoor cleanup! Just remember, the bigger the property the more work it is to maintain, Kim! You do just fine with your wonderful outdoor space! I have to attempt to dig a giant rosebush out of the garden first this year, Marty....that won't be easy! Wow,thanks for posting those beautiful pictures. I really like the garden with all the different color foliage. Actually, they're all stunning. We may get snow again here in CA this week, but we can dream of warmer days and all the work ahead. I don't think our snow days are done either, PJ, but at least for this weekend it seems we may get a break! Oooh - these are beautiful and make me so anxious for flower season! Me too, Mari! I keep urging my seedlings to grow, grow, grow - I can't wait to see some flowers once more! Such beautiful inspiration photos, Debbie! I'm in love with the last photo...the cottage garden! It's glorious, Linda, isn't it? And that sweet picket fence is the perfect backdrop! Love all of these! As you know, I've got gardens on the farm and at the cottage by the sea. My veggie seeds are sprouting, and I sure hope it warms up around here soon or I will have planted way too soon. Ugh. We are replenishing and fortifying our perennial gardens this spring, and like you, I LOVE impatiens.. they're easy and plentiful and cheery as long as they have what they need - shade, water, part sun and some varieties tolerate full sun, as you stated. They are a rockstar in my garden, Karen Ann - remember a few years back when they all got that disease? That was a sad, sad year in the garden! I love all pictured. I wish the weather here would stay warm everyday to even want to get out and clean up my yard. It's still needing work and little time to do it lately. I wish it was nothing but flowers and vegetables in an orderly way. I would probably have some nice grass then. It always grows where I do not want it. I think we all have challenges with things growing where we don't want it, Betsy - my nemesis is Tansy, which is taking over my perennial bed! I think I may have an idea why my seedlings aren't flourishing, the potting soil will not hold any water. So in spite of watering them everyday, they are drying out. I'll be getting a seed starting mix as you suggested next. Hopefully that will make the difference, Carole! I'm having good luck with a lot of my seeds, but a few are not doing well...Cleome seems to be non existent, and the petunias, although some of them sprouted, are still the size of a pin head after a month!! I can't see how they will ever be ready for planting even though I have about 2 months before I can put them out! 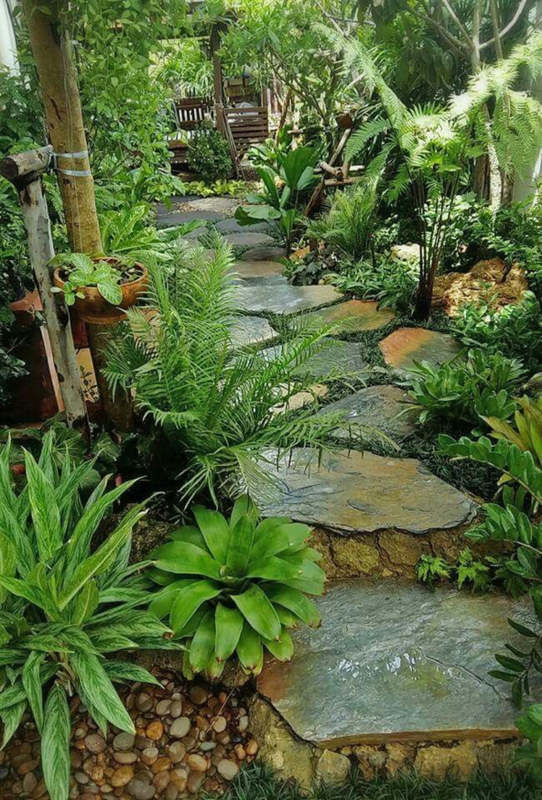 Debbie, thanks for sharing those breathtaking gardens! Now you have me dreaming of spring. We have a few flowering trees so far, but it's still looking a little bleak here. This year, I have to try something new in the window box of my garden shed. It's in complete shade, but every shade annual I plant in it doesn't do well. Going to give impatiens a try this year. Wish me luck! I love impatiens in the window box on my garden cottage, Heidi - most of the day it's in shade although it does get a tiny bit of sun each day and they do quite well in there. Good luck! Debbie, these gardens are so gorgeous!! I love those snapdragons and impatiens. So far, I've been able to keep some impatiens on the side of my house where there isn't a lot of hot sun and hope to do so again this year. Snapdragons just won't survive, I've tried. :( Love and hugs! That's a shame Benita - they are so colorful, really liven up a flower bed!! I started some from seed this year and they are doing so well - can't wait to get them outside and see them bloom! All of these gardens are so pretty! Love the pictures. I was outside last night photographing big snapdragons, they are in full bloom here, I love them! Hope spring arrives there soon, I know how you like to be outside gardening and "yard-ing" and enjoying your deck and yard and all. Surely it can't be too much longer??! Hopefully the sunny days will be coming more and more, Debbi, and melt all this lingering snow! We go from snow to mud season and then finally spring! I love those shade gardens. Calming and peaceful. Aren't they lovely, MJ? I find them so tranquil as well. Loving all the inspiration. One with all the foliage was different and pretty. Reminds me of a lot of Coleaus. Purple and green are amazing together aren't they? Here's hoping is right! I don't have a lot of luck with Coleus, which is a shame because it's so lovely. But it hates the cold, so the growing season for it is short up here. The green, white and purple to me is just stunning! For some reason I never get around to impatiens. Maybe I will this year. You should definitely try them on the shady side of your patio, Brenda. I love to mix white impatiens with all the colors I use, as they glow in the evening light. Beautiful inspiration. I hope we all will be seeing some of this pretty in our yards in the next month or so. Ahhhhhh just nice to see. Before long you'll be outside getting your lovely deck all ready for spring and summer, Kris! Your chaise will be back, your huge hanging baskets, and all the pretty will be all around you! Hey girl! Just wanted to let you know that I'm featuring this post tomorrow night at Celebrate Your Story! I hope you will share again. It goes live at 7:00 p.m. CST! Love and hugs!